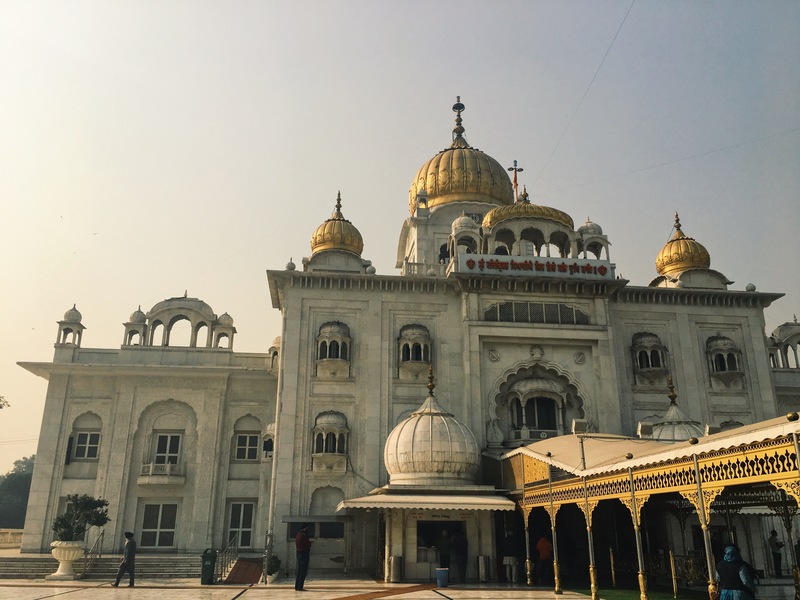 For our first day in Delhi, one of the places we visited was the Gurudwara Bangla Sahib Sikh Temple. The architecture of the temple immediately catches the eye as the golden domes shine in Delhi’s bright morning sun. Walking into the temple, the intricate designs displayed on the walls match its outwardly beauty. Sikhs entered and bowed down in front of their holy scripture, which was the main centerpiece of the temple. In a building full of worshippers and observers, three men were sitting in a single row, singing into the microphones and rhythmically beating their hands against the drums. These hymns filled the temple, and the beautiful sound lingered as we exited. This was my first exposure to Sikhism. Our tour guide informed us about some of the basic principles in Sikhism, and he emphasized the importance of charity in the religion. 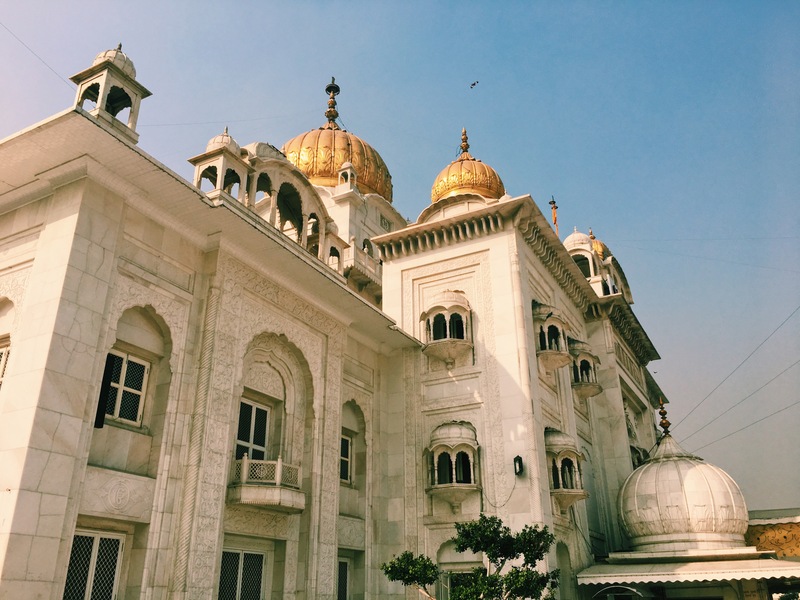 While explaining his fondness for Sikhism, our tour guide mentioned that the religion is grounded in egalitarianism for all of humanity. Similarly to Hinduism, life moves in a cyclic pattern and the notion of karma is practiced in Sikhism. However, while there are some aspects that the two religions share, the caste system is completely nonexistent in Sikhism. 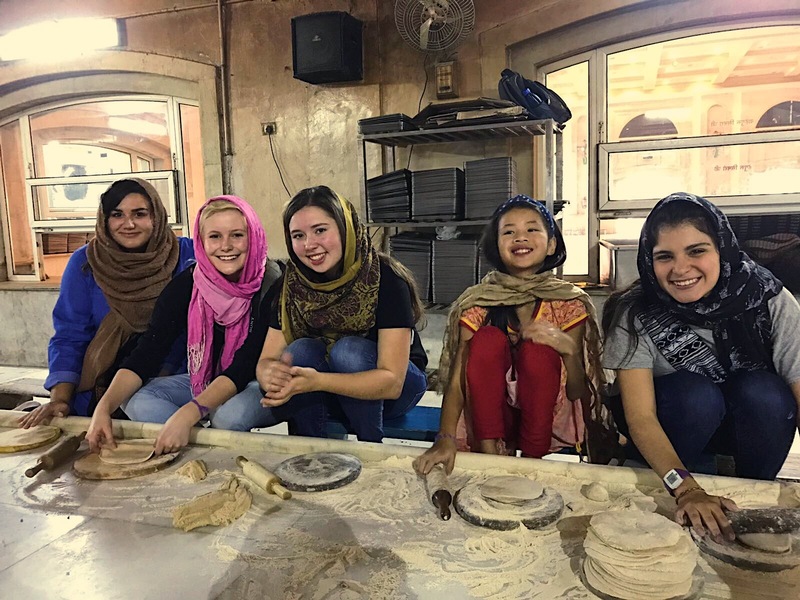 Abiding by the basic foundations laid down in the scripture, Sikhs believe that all people should be fairly treated despite their ethnicity, religious affiliations, financial status, and other distinguishable qualities. The importance of impartial treatment for all in Sikhism is one of the main doctrines that draws people to this religion. The Gurudwara Bangla Sahib Sikh Temple in Delhi, India. Photo by Hannah Metwally. A Sikh’s ultimate purpose is to reach union with God, which is the only way to escape the constant cycle of birth, life, and rebirth. To achieve this goal, Sikhs must remove themselves from a self-centered worldview and toss their ego in the dumpster. Many Sikhs attempt to do so by involving themselves in charity work. Caring for the less fortunate is actually one of the primary responsibilities of the devotees. 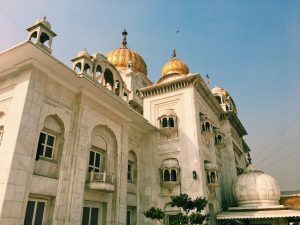 As a part of our visit to this Sikh temple, we were guided into what Americans usually call a “soup kitchen,” which is known as a langar in Sikhism. According to our tour guide, thousands of people are fed daily thanks to the local Sikhs who help the community kitchen produce the amount of food that it does. However, participation in the langar is not exclusive to Sikhs; everyone is free to offer their help. The only requirement is to wash your hands before entering the kitchen. From peeling potatoes to preparing roti, the kitchen was packed with people diligently working to serve thousands. We were also able to help prepare the roti while sitting on a ground-leveled table surrounded by huge metal pots that were used to cook the massive amount of food needed. My time in the langar has definitely been one of the most memorable parts of my study away experience. A group of people helping in the community kitchen in Gurudwara Bangla Sahib Sikh Temple in Delhi, India. Photo by Hannah Metwally. 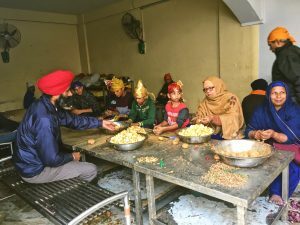 This Sikh temple provides a secure food source for Delhi’s impoverished population and is just one example of how Indian cities are able to offer some aid to the urban poor. India is diverse in its population, and a big city, like Delhi, is home to people of many religions. While the city may have a mixture of various religions, many of them share a common preaching, which is caring for the marginalized. Therefore, some poorer communities are relieved through religious institutions. However, other than religious charities, how does the urban poor in India receive basic amenities, especially in a fast-growing city, like Delhi? What is the relation between urbanization and poverty rates? A group of students also helping with the community kitchen in the Gurudwara Bangla Sahib Sikh Temple in Delhi, India. Photo by Sophia Pessagno. Rapid urbanization is not a unique phenomenon to India as urban growth is happening worldwide. With this global shift toward city life, the environment and human welfare are increasingly being challenged as pressures in urban spaces rise. Developing countries, including India, will be experiencing the most urbanization. As we’ve learned throughout this entire semester, India has struggled with mass migration into its cities. Due to the lack of urban services, such as health care facilities, educational systems, and job opportunities, people have been flooding into nearby cities. Many Indian cities have been unable to meet the rapid influx of people with the building of proper infrastructure and services. The crowding, as a result of this mass migration, has increased the amount of slums present in cities, and Delhi is no exception to this phenomenon. In just a span of ten years from 2001 to 2011, Delhi has smashed records as the city’s population has risen by 4.1% and is one of the cities to experience the most acceleration in urban development around the world. 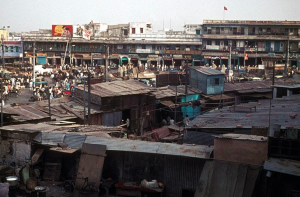 During the 1990s, Indian policy for urban-related issues began to change, attempting to better accommodate the rise in urban poor as a result of the mass migration into cities. In terms of providing sanitary and legal housing options for the urban poor, the Indian government has initiated several five-year programs, beginning in 2005, that primarily focus on shelter. However, due to the political instability of the Indian government, policies are not always put into action. Currently, Delhi’s citizens are either living in formal, informal, or organic housing developments. Informal housing developments, which are seen in the form of squatter settlements, are where the majority of the low-income citizens reside. Because there is a lack of government-funded housing options targeted for the poorer sections of the city, many have no other option but to live in informal housing developments. In Delhi organic housing developments are known as urban villages because these were rural settlements that have gradually become urban as the city has expanded. Land availability acts as one of the major impediments to providing adequate housing for the urban poor. According to Alpana Sivam, the author of the article, Urbanization and Housing for the Urban Poor: Delhi, India, explains, “land is a fixed commodity and therefore, there are not many alternatives for housing.” It is critical that a shift from housing the urban poor in informal developments to formal developments occurs. This can be done through governmental initiatives to construct high-density apartments for the urban poor because it lowers the cost of housing and takes less land space. Also, in the article, Cities of the Poor: A View on Poverty in Urban India, the author, Akanksha Sharma, states, “As long as informality renders urban populations invisible, data will be skewed and investment delayed.” Housing the urban poor in formal alternatives gives the Indian government a better understanding on the amount of people who are in need of public services, which can influence future initiatives.